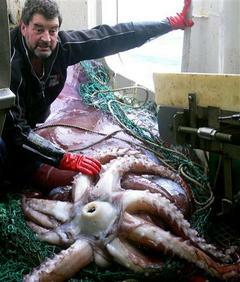 That is a mighty big squid!! Carlos, You can say that again. Let me get this straight: the squid's flesh and skin are ridden with ammonia to keep it neutrally buoyant. Does that mean that small ones are also filled with ammonia (perhaps, to a lesser extent)? And if so, are we eating it when we have those calamari rings? Now I remember why I dont eat seafood! to think they have microwave ovens that big!! but wouldnt it get too hot from the micro waves going through it? Why don't they just leave it in a big refridgerator at say 40 F until its thawed like what we do for steak? I would think a microwave would fry parts of it just like it does to a chicken breast. when are we ever gonna find some live giant squid.i mean come on , I know they live deep under water but isnt there a new gizmo out there that could help us. hey I should be on animal planat for this. A few years ago, a group of Japanese guys actually did photograph a live giant squid. There's an article at National Geographic. Someone did a documentary of the guys and their journey; I've caught it on TV once or twice. These guys baited a camera to get photos of the squid. It's not live action (one photo every x seconds). But it shed a lot of light on their movement and mannerisms. It's worth a look.